Sannino Vineyard's winery and tasting room is located in a rustic and historic barn with a casual and cozy environment. Sannino Vineyard is a place where the art of growing and crafting quality wine is shared through a unique educational and sensory experience. It’s one that’s enthusiastically shared by friendly staff, eager to inform customers. 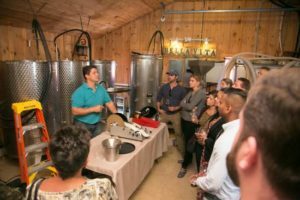 Our educational classes and tours are created for the amateur as well as the experienced wine enthusiast. An outside seating area nestled among the vines provides visitors with unforgettable sunset views as they enjoy Sannino’s quality crafted wines. We have many Estate Wines to choose from, including Merlot, Cabernet Sauvignon, White Merlot, and Chardonnay. Other Long Island varietals are also available.